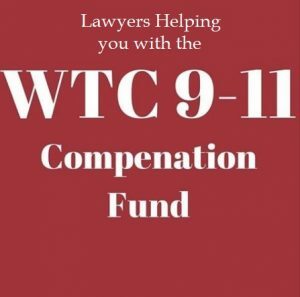 The September 11th Victim Compensation Fund was created to compensate workers, residents and students who were exposed to 1000’s of cancer causing toxins in the air; and as a result have been diagnosed with cancer. This can be ANY type of over 70 types of cancer that qualify to get the award. Our attorneys will help you with the complex and burdensome paperwork of the fund and insure that you get the maximum compensation possible. We also will help you obtain free lifetime medical care. As many as 30,000 of these people near the crash site may qualify and don’t even know it. Lung Cancer, Prostate Cancer, Breast Cancer, Bladder Cancer, Mesothelioma, Colon and Rectal Cancer, Endometrial Cancer, Kidney Cancer, Leukemia, Liver Cancer, Melanoma, Non-Hodkin’s Lymphoma, Pancreatic Cancer, Thyroid Cancer, Ovarian Cancer, Brain Cancer, and over 70 types of cancer that could be linked to the 9/11 crash site. We also may be able to help you obtain free lifetime medical care.